The Waynesboro Generals, in the thick of another Valley League pennant race, will play host to the Staunton Braves at Kate Collins Field Tuesday night. 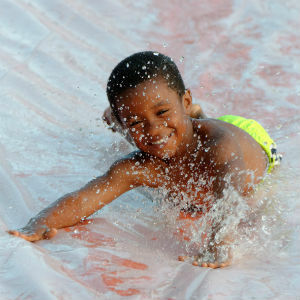 Adding to the excitement at the ballpark is the annual Waynesboro YMCA Waterslide Night. Free admission to patrons wearing a Waynesboro YMCA T-shirt. Tickets for the game are also available at the YMCA, 648 South Wayne Avenue, Waynesboro, at the front desk while supplies last. In addition to the waterslide setup on the hill overlooking the ballfield that opens at 6 p.m., the night includes a special first pitch thrown out by sponsor Memory’s Hill Stables on horseback.